Joan of Arc -- the seventeen-year-old peasant girl, who, as she said herself, "did not know ‘A’ from ‘B’," but who, in a year and a month, crowned a reluctant king, rallied a broken people, reversed the course of a great war, and shoved history into a new path --what are we to make of her? The people who came after her in the five centuries since her death tried to make everything of her: demonic fanatic, spiritual mystic, naive and tragically ill-used tool of the powerful, creator and icon of modern popular nationalism, adored heroine, saint. She insisted, even when threatened with torture and faced with death by fire, that she was guided by voices from God. Voices or no voices, her achievements leave anyone who knows her story shaking his head in amazed wonder. Dreyer’s film does not cover the dramatic events th at led this pious young girl (a) to approach the beleaguered French military leaders with an offer to lead them in battle, and then (b) to inspire a string of amazing victories over the Engolish on the battlefield. Instead, it focuses on the ecclesiastical trial that led to her condemnation, taking advantage of authentic transcripts of the trial that had come to light only in 1924. It tells how a young, unsophisticated and illiterate girl was confronted by powerful and learned judges of the Church who held life-and-death sway over her fate. All she had on her side was the firm conviction of her faith in God and in her own intense spiritual experiences. Although it may sound from this description like the film would be a talky and boring coverage of the court hearing, this is not the case. The narrative moves forward through several structured sequences, carried along swiftly by Dreyer’s dynamic editing. Sequence 2. In the next part, still less than halfway through the film, the judges realise that they are not making progress with their questioning. Even their "good-cop/bad-cop" routine hasn't worked. They decide to threaten Joan with torture. Weakened from ill-treatment and bloodletting, she agrees to abjure and confesses that her visions were false and that she had been misled by Satan. This section lasts about 24 minutes. Sequence 3. In the final part Joan recovers herself from her frailty and recants her abjuration. She is immediately condemned to be burned at the stake. Even the haughty judges are now tearfully begging her to stick with her original abjuration, but Joan, summoning up her courage to tell the truth as she knows it, says that her recantation was a lie: the holy visions were real to her. She is burned at the stake, after which the peasant witnesses riot and are then ruthlessly bludgeoned and overrun by the English soldiers from the fortress. 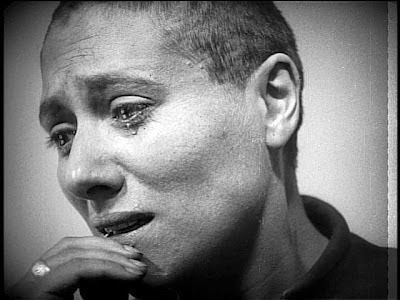 Dreyer’s cinematic approach in The Passion of Joan of Arc was extraordinarily unusual for its day, and is still strikingly unlike most films today. The film moves along at a brisk pace, with rapid cutting back and forth between the various faces of the participants: the haughty and domineering judges, and the desperately vulnerable, but steadfast, Joan. Much of the film consists of separate closeups of Joan and her Inquisitors. 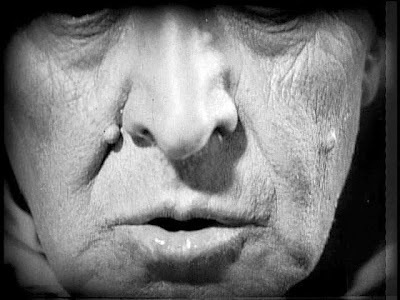 Dreyer did not follow plausible point-of-view camera setups for these closeups, so that the viewer is often disoriented. A high percentage of these closeups are shot from a long angle, with Joan gazing upwar d, above the camera line. 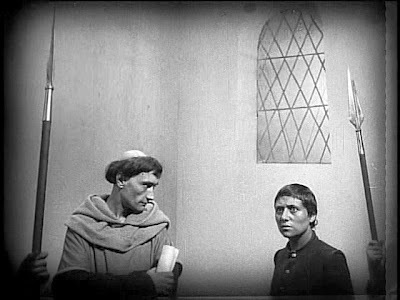 In addition, Dreyer rarely used scene establishing shots, cuts on action, or separation-resolution shots. As a result with all these separate cuts, it is difficult to ascertain where everyone is situated in the courtroom. It is reported that when Dreyer began production, he had an elaborate single set constructed prior to shooting. He then shot the script entirely in sequence. However, as he shot the film, he apparently became more and more obsessed with getting the authentic emotional performances and images in his closeups. When the film was edited, his priority was emotional authenticity over narrative and visual continuity. When I began watching the film, I was distracted by the artificiality of the relentless, seemingly random, cutting back and forth between apparently exaggerated emotional closeups. But after fifteen minutes or so, I clicked into the brilliant rhythm of the film. It takes on a visual life of its own and sweeps the viewer along like a flamenco musical piece. It becomes a delirious lyrical masterpiece that pushes the boundaries of cinematic expression far beyond verbal explication. In particular, the film offers a new variation on expressionism. 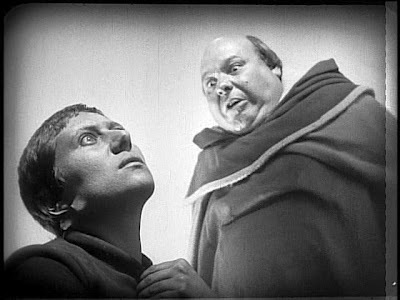 Dreyer was an expressionist, and the set he designed, presumably with the assistance of Hermann Warm, was highly expressionistic along the lines of German Expressionistic visual art. 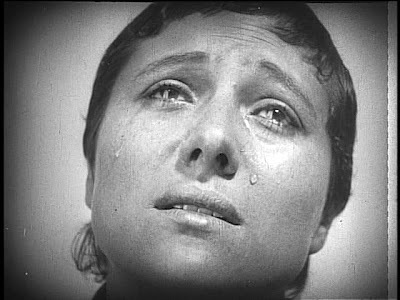 But the constructed set is barely noticeable in this film, as Dreyer pushed on to new dimensions o f expressionism by focusing on the visual expressiveness of the human face. It was Dreyer who once wrote that architecture was the highest art – even higher than cinema. The reason for his view was that an architect builds a structure that contains and hosts human existence in an intimate way, whereas other visual arts are seen from a distance. It is the artistic potential for human interactiveness that Dreyer saw as the key to architecture. Today, with location-aware wireless mutimedia offering interactive envrionments that are embedded into our daily lives, the interaction potential that Dreyer saw for architecture is being merged with cinema. But most important for us is the way we interact via the expressive power of the human face. Watts, Richard, "A Dying Art Offers a Masterpiece", New York Herald Tribune, (31 March 1929), reprinted in Introduction to the Art of the Movies, by Lewis Jacobs, (1960), Noonday Press, New York, pp. 130-133.